Copyright Notice: © 2018 HiT Entertainment Limited and Keith Chapman. © 2018 Mattel. All Rights Reserved. These are the official Bob the Builder licensed characters, Bob the Builder. 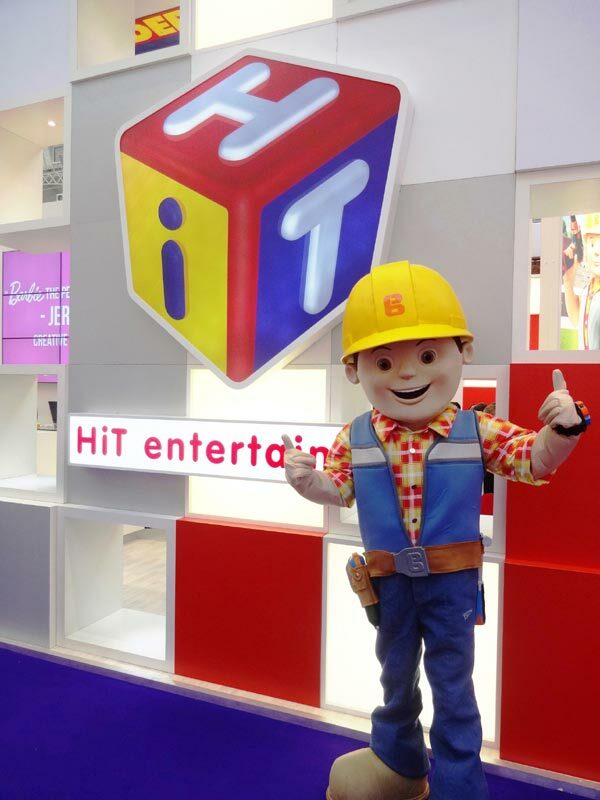 Rainbow Productions holds the UK’s official licence to manage the personal appearances of Bob the Builder at public events on behalf of the brand owner. Why hire Bob the Builder characters for your next event? Created by Keith Chapman, Bob the Builder has gone on to become one of the UK’s most recognisable names in children’s television. The show and characters have evolved since first arriving on screens in 1998, moving from stop motion to CGI graphics and even moving cities! Now based in Spring City, Bob and his team bring to life principles of teamwork and problem-solving in a way that resonates with children. 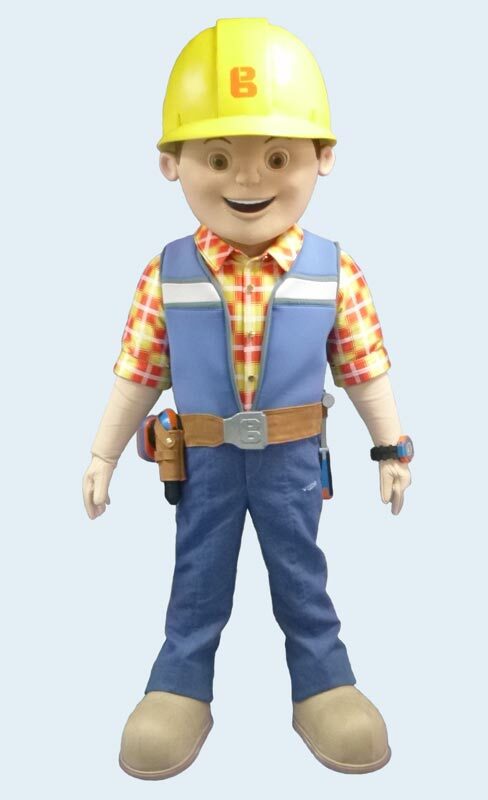 Bob the Builder costume hire is a great choice for any public or corporate event at which there will be young ones, but if you have an outdoor event with machinery or vehicles on display, this is a particularly good choice. Whether it’s an open day at a farm or perhaps a car show, any budding engineers will get a kick out of meeting Bob and becoming an honorary member of his Can-Do Crew. 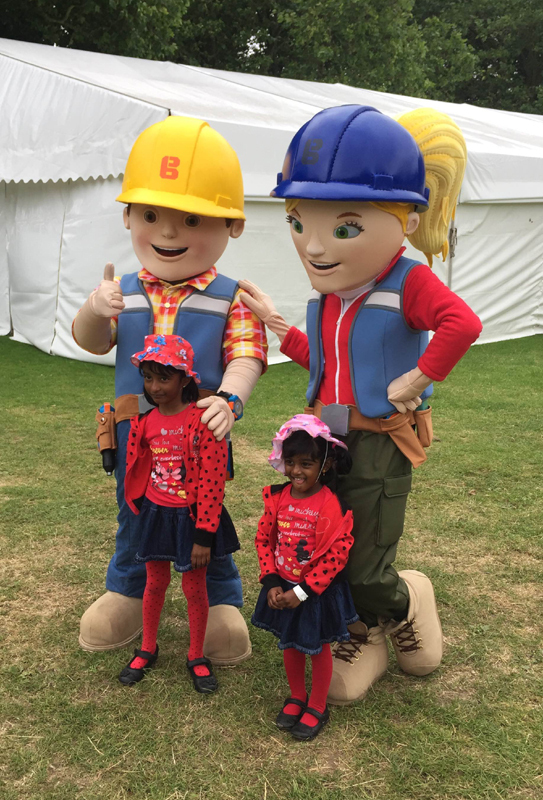 When meeting with a Bob the Builder mascot, children from preschool ages and up can have pictures taken with Bob, and as he is such a recognisable face amongst youngsters, having Bob near entry points to events can be a big draw for passers-by. Rather than rent out a Bob the Builder costume, at Rainbow Productions, we have a number of trained professionals who will attend events in full character to give children a memorable experience. When it comes to finding an official Bob the Builder costume, your search can end with Rainbow Productions. Our staff will be professional and courteous at all times, remaining in character when in costume and helping you to feel at ease as you focus on your event. Our team can travel to anywhere in the UK, and are available for events both indoors and out. When someone friendly in a Bob the Builder outfit ready to welcome and interact with guests, you can provide kids with the opportunity to enjoy a meet and greet they won’t forget. To find out more about working with a Bob the Builder mascot at your next event, contact us today. Bob the Builder has moved to Spring City, where he is the new resident builder. There’s no job too big or too small for him and his trusty team – whether it be mending a broken tile to renovating a skyscraper. The fun is in getting it done! Bob has an enthusiastic, hard-working attitude and is always ready to help the community. He is often heard encouraging his team with his well-known catch phrase: “Can we build it? Yes we can!”™. Bob’s building partner is Wendy. She is dynamic and smart and specialises in electrics. She’s quick witted and has an eye for spotting problems, so is good to have around to guide the team in the right direction. Bob the Builder has been given a new-look in his all-new revamped TV series, which aired in September 2015. Bob the Builder allows children to explore topics such as team work, science, technology, engineering, arts & mathematics. 2018 marked 20 years of global success for Bob the Builder and his Can-Do Crew. The Bob the Builder Magazine is one of the longest running pre-school titles in the market. Character costume Bob the Builder is available to book to attend UK events.